From the School of Nutrition and Food Sciences (R.H., M.M), Tabriz University of Medical Sciences; Road Traffic Injury Research Center (M.A.-J), Tabriz University of Medical Sciences; Ardabil Province (D.A. ); Department of Genetics (S.S.H.-A. ), School of Medicine, Ardabil University of Medical Sciences; Department of Biochemistry and Diet Therapy (S.R.-A. ), School of Nutrition and Food Sciences, Tabriz University of Medical Sciences, Iran. Effects of vitamin D3 supplementation on serum levels of proinflammatory and anti-inflammatory markers (n = 25 per group). 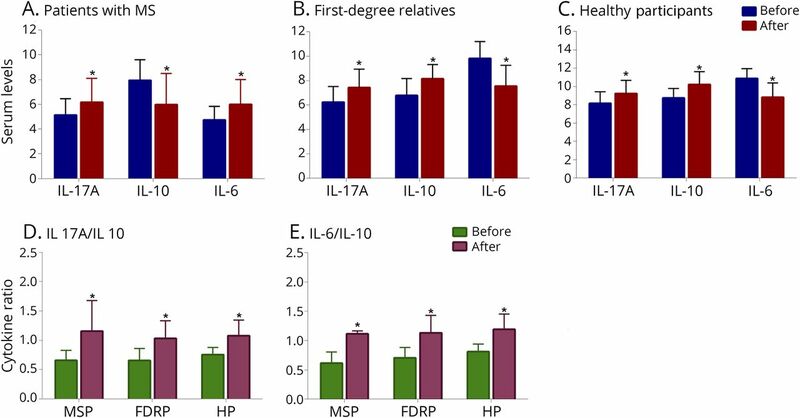 (A–F) IL-6, IL-17A, and IL-10 mRNA expression levels of healthy controls (HCs), multiple sclerosis participants (MSPs), and first-degree relative participants (FDRPs). HPs (A), MSPs (B), and FDRPs (C). One-way analysis of variance, followed by the post hoc Tukey test, was used. Data were expressed as mean ± SD, and p < 0.05 was regarded as statistically significant. 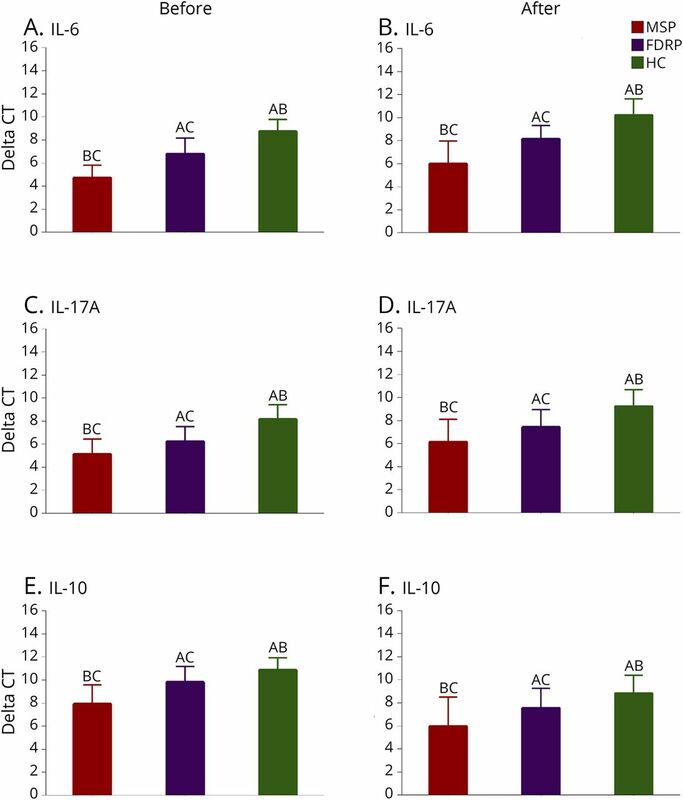 Effects of vitamin D3 on serum levels of proinflammatory and anti-inflammatory markers (n = 25 per group) (A–C) and the ratio of pro-to anti-inflammatory cytokines (D and E). 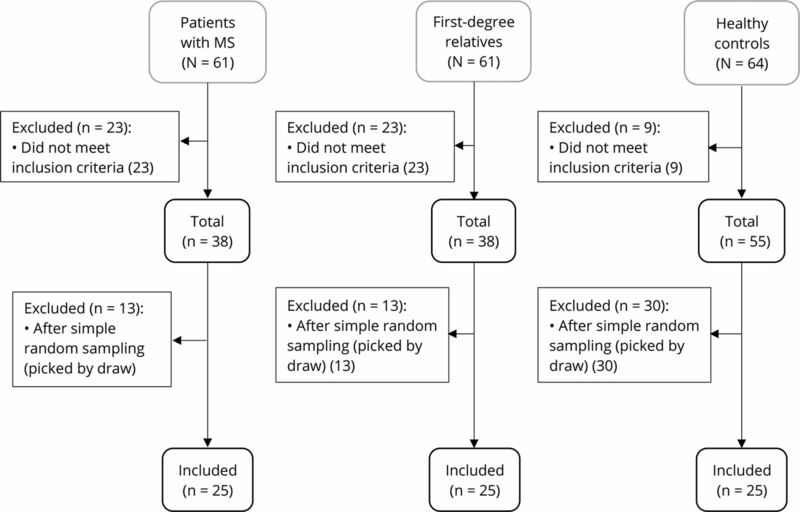 IL-6, IL-17A, and IL-10 mRNA expression levels of healthy participants, patients with MS, and first-degree relatives. Paired t test analysis was used. Data were expressed as mean ± SD. *p < 0.05 was regarded as statistically significant.